The application provides long-term audio analysis capabilities, based on semantic audio processing concepts, delivering real time audio-pattern recognition, visually resulting into an event detection markup time-line. A dynamic audio-samples database is used as a pattern-storing matrix, which is configurable by users and an audio semantic engine is capable of detecting audio events and patterns. 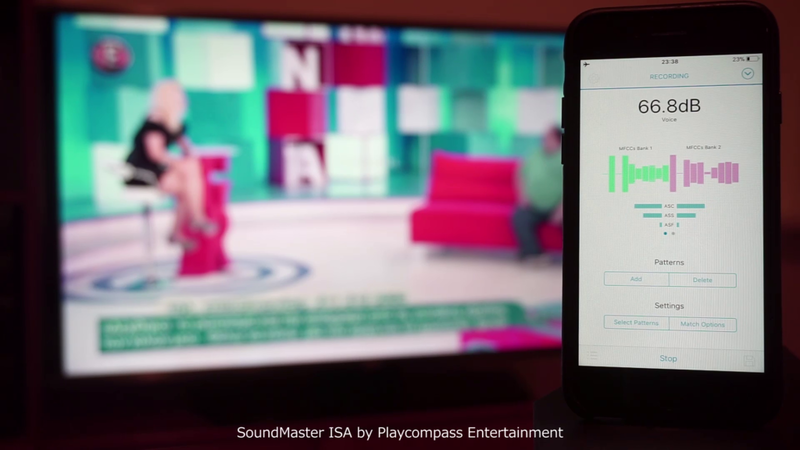 We are proud of SoundMaster’s Intelligent Sound Analysis [ISA] feature, because it is designed to deliver robust performance, incorporating state-of-the art sound recognition techniques. Temporal audio feature integration, spectral filtering and intelligent dynamics processing are some of the methods that guarantee accurate audio-event detection. The following video showcases this capability. Please note that SoundMaster successfully recognizes audio patterns played back by a television and not produced by original sources (humans, musical instruments, devices etc), getting over any audio distortion introduced by sound recording and playback processes (e.g. limited frequency response of the speakers).